Late last year in a PMQs exchange about tax, the Prime Minister said that “the top 1 per cent of earners in this country are paying 28 per cent of the tax burden” – “the highest percentage ever”. She’s not alone in saying this. As statistics go, this one is remarkably popular in newspapers, parliament and other political debate. We can expect to hear it a lot more this week as well, as on Friday we will get an update of this and related data from HMRC. But users of these statistics should be cautious. Firstly, they do not refer to all ‘earners’, just those who pay Income Tax. And of course the ‘tax burden’ stretches far wider than Income Tax. As this blog explores, these important distinctions make these statistics far less meaningful. 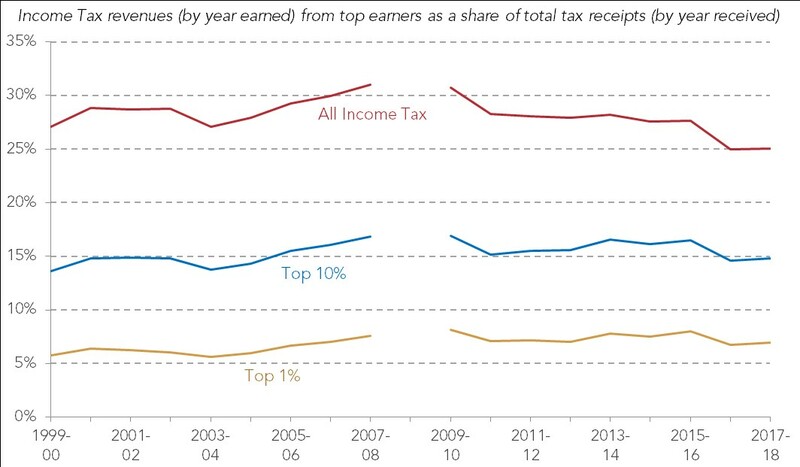 The HMRC data shows that the share of Income Tax paid by the top 1 per cent of people who paid Income Tax has indeed risen to 28 per cent, while the share paid by the top 10 per cent has risen to 59 per cent. This can be put down to tax policies that have made Income Tax more top-heavy, including a higher tax-free allowance and the ‘additional rate’ for top earners (now 45p but briefly 50p). However these statistics refer to a narrow selection of the population, and a very narrow selection of taxes. Source: HMRC Table 2.4. Note HMRC has not released stats for 2008-09. 2015-16 onwards are projected estimates. The HMRC stats cover 30.3 million people in 2017-18 – with 23.9 million below the age of 65 and 6.4 million above. But the 16+ population in late 2017 was 52.9 million, and the 16-64 population in employment was 31 million. So there are – among others – seven million working-age people who are in work but who are not ‘Income Taxpayers’. This shouldn’t be a surprise – in fact the government itself has bragged about how many millions of workers and pensioners it has ‘taken out of Income Tax’. The number of workers paying income tax has actually fallen by 2.2 million between 2007-08 and 2017-18, despite employment rising to record highs over that period. Income Tax is the country’s largest tax, raising £181 billion in 2017-18. But even this represents just 26 per cent of all tax raised. The Income Tax bill of the top 1 per cent of Income Taxpayers is around 7 per cent of all revenue – very substantial but hardly a full picture of the tax system. Source: HMRC Table 2.4 and OBR March 2017 tax figures (for consistency with HMRC). Note HMRC has not released stats for 2008-09. 2015-16 onwards are projected estimates. HMRC Income Tax figures are based on the year the income is earned while OBR receipts are based on when taxes are received. So what big taxes do these statistics miss out? Firstly, they ignore National Insurance, despite it operating in parallel to Income Tax and being the country’s second biggest tax (raising £131 billion a year, including employer National Insurance). Indeed, for everyone earning up to £16,500, employee National Insurance is more significant than Income Tax. And while most people pay National Insurance at a rate of 12 per cent, higher and additional rate payers only pay 2 per cent – giving it a regressive structure unlike Income Tax. HMRC could produce statistics combining Income Tax and National Insurance. But that would still ignore the majority of tax paid. Happily, the Office for National Statistics does produce estimates of every tax paid by those on different incomes – though switching now to households rather than individuals. Putting together Income Tax, personal National Insurance and Council Tax, the 10 per cent of households with the highest income paid 34 per cent of those taxes; but they also had 31 per cent of the market income and 27 per cent of income after benefits are included. The bottom half had 18 per cent of the market income and paid 17 per cent of those taxes. 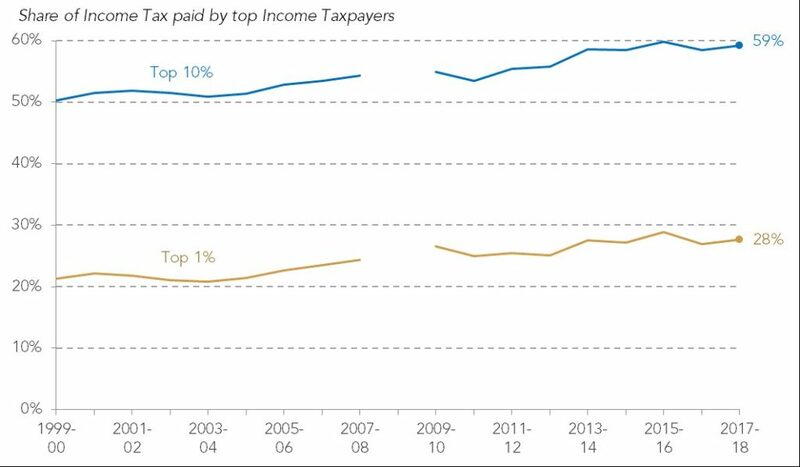 Adding in all other taxes, most importantly VAT, we find that the top 10 per cent paid 27 per cent of tax – perfectly in line with their gross income (and below their share of market income). Indeed, every decile here pays tax in almost exact proportion to its gross income – implying a flat tax system as a whole. 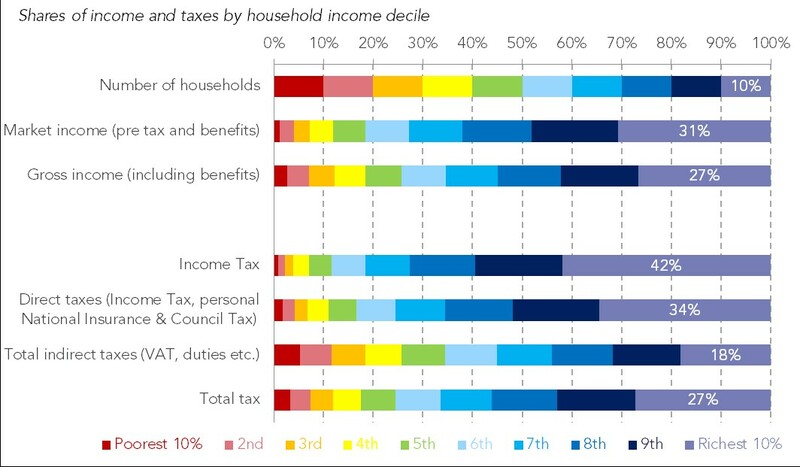 Now, in contrast to the HMRC Income Tax facts, these are only estimates – based on household survey responses (that are known to underestimate incomes at the top and bottom) and on simplistic assumptions about who ultimately pays for taxes like corporation tax and employer National Insurance. But – unlike the HMRC stats – they cover 100 per cent of tax rather than 26 per cent, and (almost) all of the population. So both the users of such statistics (from senior politicians to commentators and campaigners) and those who produce them (including HMRC and the ONS) should seek to do better in ensuring that the statistics that get the most air time are the ones that give the fullest, most meaningful picture of the world.